There are many benefits to living in California. We have gorgeous weather, wonderful people, and beautiful natural spaces that range from beaches to mountains and deserts to forests. Of course, there are downsides and perhaps the most-voiced concern (aside from cost of living!) is the ever-present risk of earthquakes. While earthquakes are a natural phenomenon, the actions or inaction of people/entities can add to the risk of injury or property damage. At the Brod Law Firm, our Northern California earthquake lawyer helps people bring civil lawsuits after a California earthquake. These include suits against various parties whose negligence had tragic results as well as suits against insurance companies who deny valid claims. This week, the world was reminded of the havoc and tragedy that earthquakes can unleash. As CNN reported, a 6.2 magnitude earthquake struck central Italy in the early hours of Wednesday August 24. Early reports put the death toll at 73 (Note: The number has since increased to at least 241.). The mayor of Amatrice, where most of the fatalities occurred, told CNN: “The town is no more.” At least 100 people were injured. Officials expect death and injury tolls to rise in as rescuers dig through the rubble. The risk is far from over as aftershocks are expected to roll through in the coming days. As we were preparing this piece, news began to come in about another major earthquake that hit the very same day in Southeast Asia. NBC reports that a 6.8 magnitude earthquake struck central Myanmar at around 4:34 PM local time. Early reports suggest that three people died. While earthquakes are common in the area, casualty numbers are usually limited because there are no heavily populated cities nearby. However, Wednesday’s numbers may still climb because reports are slow to roll in from the small, remote villages in the region. Wednesday’s major quakes occurred abroad, but dangerous earthquakes can and do occur throughout California. While we cannot sue Mother Nature, in some cases earthquake damage (including injury and loss of life) is made worse by the actions or inacti on of negligent individuals/entities. For example, we previously discussed a case in Southern California in which a court held a store liable for the deaths of two women who were crushed by debris as they tried to escape a store during a 6.5 magnitude quake in Southern California. As the Los Angeles Times reported, a jury awarded nearly $2 million to the families after finding the property owners negligent for failing to make the building safer. 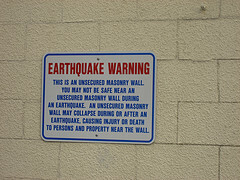 An appeals court confirmed the ruling in 2010 noting that simply complying with city building laws “did not insulate owners of unreinforced building from negligence in failing to retrofit building.” The article also lists several notable settlements in earthquake injury and earthquake death cases. Property owners are not the only potential targets in earthquake lawsuits. In Oklahoma, as reported by Tulsa World, the Supreme Court in 2015 cleared the way for lawsuits to proceed against energy companies based on claims that their actions caused an earthquake that resulted in injury. Other parties that might be appropriate defendants in earthquake cases include construction companies, architects, electricians, and municipal authorities. Of course, that list is far from complete as each tragedy has its own unique story and circumstances. A second way Attorney Brod helps earthquake victims is by serving as a San Francisco earthquake insurance lawyer. Standard policies exclude earthquake-related damage and injury from coverage. Earthquake insurance is readily available — every company that sells residential insurance policies must offer earthquake policies as well — and it is a smart purchase for many Californians. However, as with other forms of insurance, you should not assume the insurance company is on your side. Far too often, insurance companies deny valid claims. As a Northern California earthquake insurance lawyer, Attorney Brod helps people fight unjust denials and get the coverage they’ve paid for, especially when the denial involves a specialized policy that the insured opted to obtain for extra coverage. Earthquakes are a reality in California. Knowing it could happen here only adds to the thoughts and prayers we send to those affected by earthquakes internationally. We urge all of our readers to prepare for an earthquake. The Red Cross has useful advice on preparing for an earthquake and responding when one strikes. If you’ve been injured, lost a loved one, or suffered property damage in an earthquake and believe that someone else’s negligence contributed to the harm, please contact us. As an Oakland, Santa Rosa, and San Francisco earthquake law firm, we can help evaluate your situation and bring claims against appropriate parties. While you can’t recover compensation from Mother Nature, you may be entitled to compensation from other parties at fault or from your insurance company.